The University of British Columbia’s recently completed Robert H. Lee Alumni Centre, one of several Glotman•Simpson UBC projects, is one we’re proud to have had a hand in innovating. This new centre serves as a key resource for UBC alumni (of which there are an estimated 300,000) as they do business, expand their careers, and engage with other alumni. 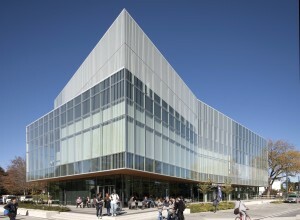 The Alumni Centre houses the UBC Board of Governors Meeting Hall, a centre of innovation, a 300-person celebration space, reception and banquet facilities, social connection and networking spaces, a cafe, offices, high-tech meeting areas, and a library on the main floor. Located centrally in the heart of UBC’s campus, the centre is a 40,000 SF/four storey building comprised of concrete, steel and glass; designed to look like a floating glass cloud. The Alumni Centre is a great looking, architecturally dynamic building with cutting-edge elements including an interactive display chronicling UBC’s history and the achievements of its alumni. It is targeting LEED Gold certification with the extensive use of local Douglas fir and the use of solar energy to help heat the building. Construction Manager: Syncra Construction Corp.